This week Big Bear Lake has been teased by a bit of snow! It’s probably not quite time to get the snowboards and skis loaded into the car, however with the skiffs of snow and the cold temperatures, we certainly know that the Big Bear ski season is just around the corner! Having grown up with a family that planted by, fished by and gauged the weather by the Farmer’s Almanac, I still turn to the almanac to see when it predicts snow in the Southern California mountains. It is a bit unusual to get snow in Big Bear in October, or at least enough snow that it stays on the ground. We depend on the ski resorts to manufacture snow to cover the slopes by Thanksgiving, when it’s cold enough. This year, the Southwest Region forecast predicts some snow in the mountains November 3-5, 11-13,19-20, and 26-28. This will work perfectly to form a good base for the slopes. December 2011 is showing several periods of snow and I got excited when I saw the almanac is predicting a White Christmas in Big Bear! Remember tocall ahead to Big Bear Frontier for one of the nicest places to stay in Big Bear Lake. The rooms and cabins have fireplaces and hot chocolate is provided in the room or in the lobby to help you warm up after a cold day on the slopes. If you are an avid snow sport lover, you may want to look at the Farmer’s Almanac to plan your trips to the Southern California slopes. Overall, it says that the upcoming winter will be “kinder and gentler” than last winter. Or maybe you want a job at Bear Mountain or Snow Summit this year? The first job fair will be held on October 15, 2011 at Bear Mountain. Bear Mountain and Snow Summit will interview from 8:00 a.m. until 2:00 p.m. for both inside and outside part and full time seasonal positions. Every year, seasonal employees move up to Big Bear from lower elevations to work and enjoy their favorite snow sport. 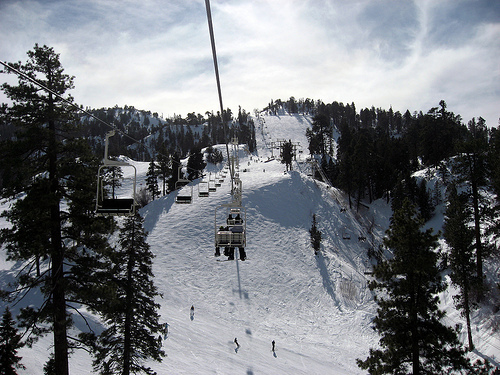 Share with us some of your mountain trips to Big Bear, we’d love to hear them! Gallery | This entry was posted in The Seasons and tagged Big Bear CA, big bear lake, skiing, snow, vacation, weather, What to Do, winter sports. Bookmark the permalink.